So you want to learn how to day trade? The first step to getting started trading is to join our chat room and get a feel for our community. We encourage all of our members and future trading course students to start by simply sitting in our live day trading chat room. We understand that everyone has their own personality and trading preference, and that we may not be the best for fit everyone. Before jumping into our full length trading courses we want you to make sure we are a good fit for you! At the same time, we learn if you are a good fit to work with us in our one-on-one mentor program. Our best students work closely with us as we work to build your trading skills and turn you into a highly profitable trader. Learning how to day trade is something that we want to make fun and enjoyable! That means we need to work together well. During the first week in our chat room if you think we are a good match then we’d encourage you to get started with Step 2! We have partnered with Fantasy Stock Traders to provide our students with a real-time Trading Simulator for paper trading. 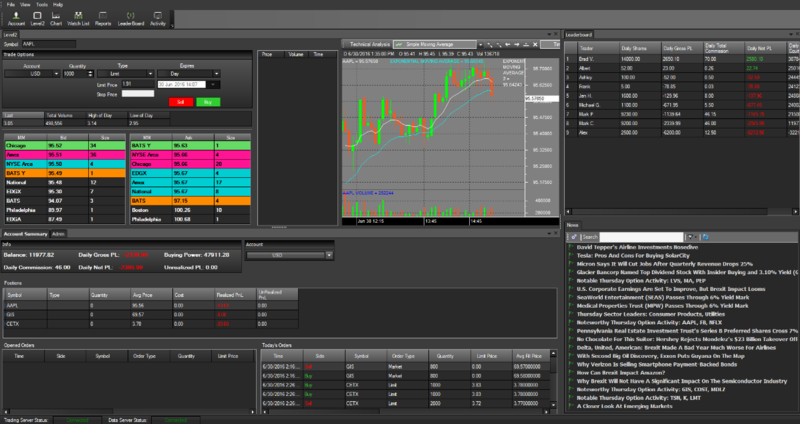 This simulator offers Level 2, Time & Sales, Charts, and most importantly, allows us to monitor your trades. This means when we see you making mistakes we can point them out immediately and set you back on track! We provide Trading Mentors to work with students in our Warrior Pro Trading Courses. Our goal is to allow you to day trade in a safe environment so you can practice the strategies you’re learning without risking real money. You should never day trade with real money until you’ve proven you can trade profitably in a simulated Paper Trading account! Getting started trading required paper trading for at least 1 month. This is something we discuss extensively in our Trading Courses. If I had traded in a simulator while I was learning it would have saved me tens of thousands of dollars, not to mention the emotional turmoil of losing money month after month. I can’t tell you how many traders have emailed me saying they’ve lost money in the market because they were trading unproven strategies. This is the exact reason why 90% of traders will fail. So let me propose an alternative, before trading with real money, prove you have what it takes to be profitable by trading in the simulator for at least 1 month. Until you can trade with a min of a 50% success rate and 2:1 profit loss ratio, you should save your hard earned money instead of trading with it. Step 3. Join our Full Length Online Day Trading Courses. This is where your Intensive Education Begins! Warrior Trading is a community based on education. Getting started trading means investing in your education! When you join our full length trading courses, either the Swing Trading Course, the Day Trading Course, or the Warrior Pro Trading Course, you will get our full attention as teachers. We take all of the students in our community under our wing. It’s our goal to see you succeed. To that end, we train you in the most important elements required to success. We start with intensive review of risk management. Having reviewed the trading accounts of failed traders we realized the most important skill for long term success is risk management. Most failed traders experience small wins and big losses, and a poor percentage of success. Knowing that most day traders lose money, we bluntly address the causes of failure so you can understand what you need to do to be among the few who succeed. We then teach you how to choose the right stocks to trade each day, and we share our stock scanners with you. Once you understand how to manage risk and choose the right stocks, it’s time to find your entries! I focus on the simplest patterns because keeping it simple has always worked really well for me. Step 4. Funding a Live Trading Account – How Much Money Do I Need? Once you have graduated from our Trading Courses and you have proven that you can be a profitable trader in a simulated trading environment you will be ready to trade with real money. It’s important to note that not everyone has the aptitude or the risk tolerance to be a full-time day trader. By this point in your journey to become a day trader you should be able to form a honest opinion whether or not it’s a good fit. For students who have thrived in the trading courses and who have generated profits in their Demo account will typically look to fund a live trading account within the first 1-2 months of beginning their training. When you fund a live account you have two options. Trading the US Equities Market requires a min of $25k because you will be considered a Pattern Day Trader (PDT). The PDT Rule is maintained by all US Stock Brokers including our favorite Lightspeed Financial. If you find yourself below the $25k min threshold you aren’t alone! TradeZero is a broker based in Nassau, Bahamas, that most traders use when they are below PDT use. I have personally used TradeZero and hundreds of our students have as well. TradeZero has an account min of $500, allows 6x leverage, and unlimited day trading as long as you maintain your $500 balance. If you fund a TradeZero account with $3k you will have $18k in buying power ($3k x 6 leverage = $18K). Most of our students who graduate from the Trading Courses will trade with 1-2k shares. This means with a $3k TradeZero account you will be able to trade full size on stocks under $9. Become another successful Warrior Trading student who is making a living as a Day Trader and consistently hitting their $200/day Challenge. Remember that $200/day is $52k a year. We aim to achieve this goal trading from 9:30-11:30am. We have structured the trading room for live trades from 9:30-12pm and then education in the afternoons. Afternoon trading can add icing to the cake but is not necessary for most beginner traders. If we trade in the afternoons we manage risk by using smaller positions. I typically spend the afternoons reviewing the trades our students are taking in the simulator and providing education by explaining what students are doing right or wrong. Once you have proven you have the skills to be a profitable day trader you will feel confident investing in some of the best tools. We encourage new students to keep the monthly overhead as minimal as possible. This means utilizing free tools. Eventually you will want to use the same tools I’m using, including Trade-Ideas, Benzinga, and eSignal. These can easily add $300/mo in overhead. There is no reason to take on this added expensive until you are generating real profits from a live trading account. 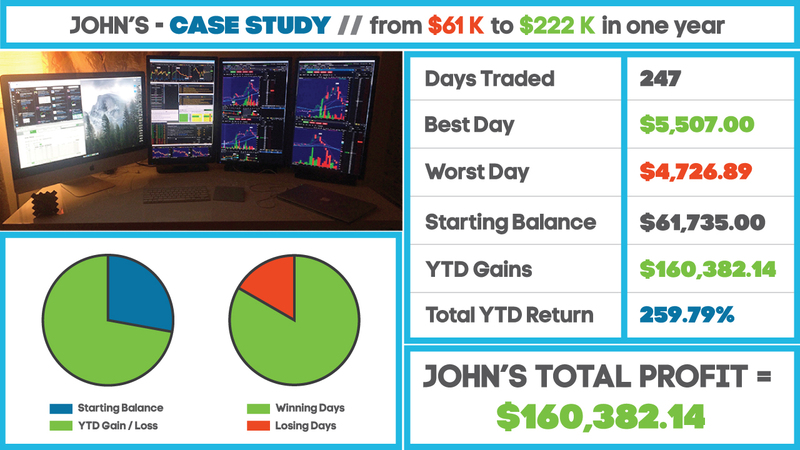 In my first year I lost $30k in trading losses, plus an extra $5k in expensive software fees. I didn’t spend a penny on education. I learned the hard way! Hopefully you will make better decisions as a new trader than I did. Remember that the market will always be here. It’s best to wait until you have proven you can be consistent before increasing your overhead. Many beginner traders find that they simply tread water for several months before they start to gain traction. One of the most important tools for a beginner day trader is Trade-Ideas. This is the software I use for all my stock scanning, and it’s where I find the majority of my trades each day. I have created a custom set of scanner settings to look for momentum stocks that I feel have an 80-90% chance of giving me a profitable trade. At this point in your journey of learning how to day trade, you should be profitably trading the markets with the team at Warrior Trading. Our Mission is to help 50,000 traders on their journey to success over the next three years. Become our next student today! $31,202.73 in profits since joining Warrior Trading. If you really want to learn from the pros, I can say from experience that Warrior Trading offers top notch training from very skilled, highly disciplined and successful instructors. I promise you there isn't a chat room out there that has this level of experienced traders interacting daily to help one another out, you just can't beat it. Up to $5000 in one day. When I first started trading I would have a profit of $3000 in a good month. After I took Warrior Tradings day trading course I now do between $1500 to $5000 most days. 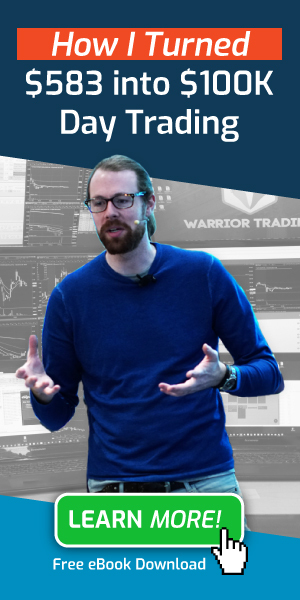 The guys at Warrior Trading has made a course that does not only contain a great strategy but it's also explained so it´s easy to understand. 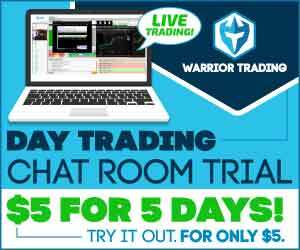 For people that are serious about their trading, Warrior Trading is the place to be. 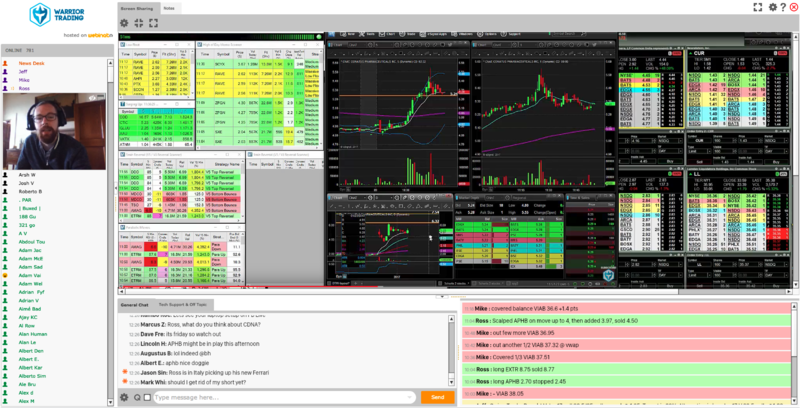 I'm a Veteran trader Finance Degree from OSU and always still learning books audible and purchased Warrior Trading Program so much new and useful information that I bought monthly chat to watch them apply principles they teach and to get some new fresh Ideas. Excellent trading education even for Advanced Traders with experience. Warrior Trading is without a doubt the most professional trading service/family I've ever been involved with. I have been trading off and on for over 15 years and full time for the past year and a half. The transparency of Warrior Trading is one aspect that attracted me to them. They show you it all. They show you their losses as well as their gains. They are about showing you how to make a profit from the markets. Trading is hard, but warrior trading makes it easier.They keep a consistently friendly atmosphere, which you will find that after trading for a few years, you will appreciate. Traders like consistency, and when you log on to Warrior Trading you can expect the same service as the day before. There are no surprises. These things are valuable. They quietly establish an edge, make their money, and leave until the next day. Ross and his team are good guys, and if you were to subscribe to all the different services out there and compare them for 3 months, you would see WT at the top of the list. I've always been passionate about trading but never really imagined this passion would have turned in a real, full-time job. In fact, I've never found any service which I really felt that would help me become a professional trader. That is, until I met Warrior Trading. In particular, Ross has been really inspirational while I'm on my path to become a full-time day trader. I always wanted to trade stocks but I saw all those numbers go up and down and I would always say to myself " I'm never going to get this". I looked at the free Youtube videos and I was hooked. It was the best investment i ever made. Now I know how to day trade and the scare part about it is gone, I mean, I listened to them and paid for their paper trade and now i feel confident on what I'm doing with stocks. The courses are a must for whoever would like to make day trading a career. I learn so many ways to help me save money and make money. The day I finished the course I did not have a losing day where I lost over $300 dollars! My worst loss prior to the course was close to $15k!!!! Ross helps you understand how the losses happen, the psychology behind it and how to prevent it! I feel a lot more comfortable trading, because now I understand what stocks to pick, when to get in and out and how to manage my risk!! Join our chat room Today! IF YOU DO NOT AGREE WITH ANY TERM OR PROVISION OF OUR TERMS AND CONDITIONS, PLEASE EXIT THE SITE IMMEDIATELY. PLEASE BE ADVISED THAT YOUR CONTINUED USE OF THIS SITE OR THE PRODUCTS OR INFORMATION PROVIDED THEREBY SHALL INDICATE YOUR CONSENT AND AGREEMENT TO THESE TERMS AND CONDITIONS. Warrior Trading may express or utilize testimonials or descriptions of past performance, but such items are not indicative of future results or performance, or any representation, warranty or guaranty that any result will be obtained by you. These results and performances are NOT TYPICAL, and you should not expect to achieve the same or similar results or performance. Your results may differ materially from those expressed or utilized by Warrior Trading due to a number of factors. Copyright © 2019 Warrior Trading™ All rights reserved.